To improve the environmental credentials of the BID’s area by increasing recycling performance and quality as well as reducing waste vehicle movements through the consolidation of waste collection suppliers. Heart of London Business Alliance was the first to team up with Commercial Waste Services in this way, working to common cross-organisational aims and goals. BIDs perform a variety of valuable functions for the benefit of the business communities they serve. What are business improvement Districts and what is their purpose? Business Improvement Districts (BID’s) are business-led-organisations that are elected by local businesses every four years. They’re funded by a mandatory levy on all eligible businesses after a successful ballot. BIDs provide additional or improved services, identified by the local business community in their area. This could include promotion, marketing, extra safety, cleaning or environmental measures in the area the BID covers. Most BIDs work to deliver a development programme in their specific area. BID’s often provide environmental services over and above the baseline services that are delivered by local authorities. What area does Heart of London Business Alliance cover? Heart of London Business Alliance is a BID covering the Piccadilly, St James’s and Leicester Square areas in Westminster. They serve as a voice for over 500 businesses and 100 property owners in the West End and provide exclusive services and schemes such as its successful and popular waste and recycling consolidation scheme. 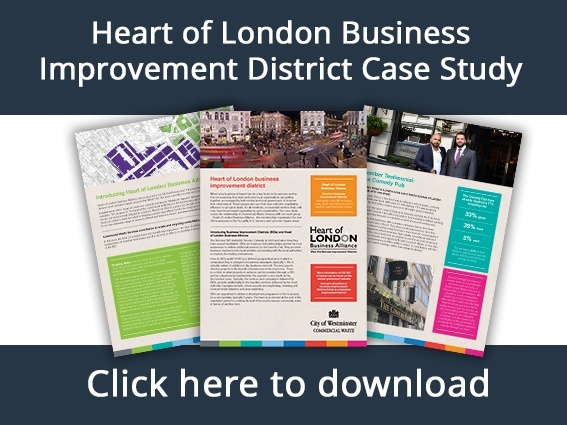 You can learn more about Heart of London Business Alliance and the role they play in the full case study. In September 2017, Westminster City Council Commercial Waste Services was selected as one of Heart of London’s preferred commercial waste suppliers. They came to this decision after assessing our quality and transparency of services against other waste operators and the benefits of working with us, as Westminster’s Waste Collection Authority. Better air quality as fewer waste collectors will be travelling through the West End of London, minimising vehicle emissions and congestion. Discounted waste and recycling collections, which have saved businesses with a membership over £19,000 to date. You can see the full list of benefits by downloading the whole case study. We spoke to two firms in the entertainment and leisure sector who feature in our case study. The Comedy Pub and The Comedy Store have been enthusiastic about the new service, and when it comes to recycling, they take this extremely seriously. In the full case study, we look further into how the preferred suppliers’ initiative has created benefits for The Comedy Pub, Comedy Store and all businesses within Heart of London Business Alliance’s area. Get your copy by clicking below.